The Russian state technology conglomerate Rostech, target of U.S. and EU sanctions, has agreed to explore and develop coal deposits with China’s Shenhua Group. Rostech, the Russian state-controlled technology and defense concern targeted by Western sanctions, signed an agreement with China’s Shenhua Group, the largest producer of coal in the world, to explore and develop coal deposits in Russia’s Siberia and Far East. The total cost of the project, including the construction of coal-fired power plants that will sell electricity in Russia, China and other Asian countries, will be $8-10 billion, Rostech said in a statement posted on its web site. Moscow-based Rostech controls a vast network of hi-tech operations in both the civil and defense sectors, including the company that manufactures Russia’s famous Kalashnikov rifle. The firm is named among the targets of U.S. and European Union sanctions, which aim to limit the company’s access to western financial markets. The Rostech-Shenhua deal comes at a time of greater cooperation between Russia and China in the energy sphere, spurred on by increasingly difficult relations between Russia and Western countries. In May, Russian natural gas exporter Gazprom and China National Petroleum Corporation (CNPC) ended years of negotiations and inked a historic 30-year agreement worth $400 billion to deliver gas to China. In a statement responding to the U.S. and EU sanctions, Rostech accused EU politicians of escalating the conflict, and said that the measures would hinder both sides. Rostech’s chief executive, Sergey Chemezov, is also personally targeted in the sanctions, which freeze any assets he might hold abroad and restrict his ability to travel. Rostech has said the sanctions won’t affect any of Mr. Chemezov’s personal property. The Rostech-Shenhua agreement was signed September 4 by Mr. Chemezov and Yuzhuo Zhang, the chairman of Shenhua Group Corporation. The companies aim to explore and develop the Ogodzhinskoye coal deposit, located in the Amur Region. Coal reserves at the mine are estimated to be 1.6 billion metric tons. Rostech expects coal production to start in 2019 with an annual output reaching 30 million tons. The commodity will be largely exported to the Asia-Pacific Region, especially China. Rostech and Shenhua also plan to build a marine coal terminal at Port Vera in the Primorsky Territory with annual capacity of 20 million tons. The construction is slated to begin in 2015 and Port Vera will be put into operation in 2018 – 2019. “The project to construct Port Vera will help implement the development strategy for the Far East and the Russian coal industry. 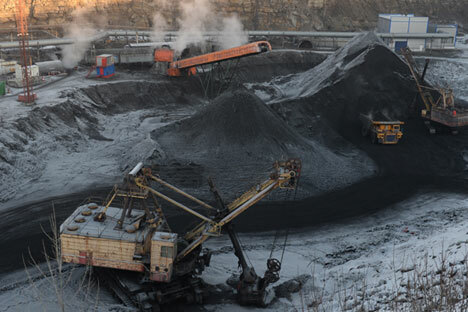 It will greatly expand the access of Russian coal companies to sales markets in the Asia-Pacific region,” said Andrey Korobov, CEO of RT Global Resources, the Rostech subsidiary that oversees commodity and infrastructural projects in Russia and abroad. The agreement also foresees constructing high-voltage transmission lines to China, as well as social and transport infrastructure. According to Mr. Chemezov, the project will help deal with the issue of power shortages in Russia’s Amur Region and China’s northern regions and meet the electricity demand of those territories. The project may also create 10,000 new jobs. The Russian strategy for developing the coal sector through 2030, as mapped out by the country’s Energy Ministry, foresees transferring the center of the production to Russia’s eastern regions, where Russian coal, thanks to short transportation distances, can compete in Asian markets, which now total 80 percent of the world consumption. “The Asian and Pacific Ocean regions are still the world’s locomotive for driving coal imports, while Europe on the whole does not appear to be a potential consumer,” says Alexander Grigoriev, Director of Research at the TEK Institute of Natural Monopoly Issues. “Nevertheless the price situation in the last 12-18 months remains rather depressing: prices on thermal coal are at a level of about $80 a ton. This places Russian exports at the limits of profitability, and only the devaluation of the ruble this year helped ease the position of Russian exporters,” says Mr. Grigoriev. “In Russia operating profitability barely exceeds 10 percent, and with all the costs the sector is just balancing on the edge of profitability,” says Kharek Avakyan, Financial Analysis Director at BPS Consult.